Boston & Philadelphia SS Co.
J. H. Brown & Co.
L. G. Burnham & Co. The Black Ball Line, later also called the Old Line, was one of the historic endeavors in all of shipping history, the first "line" of vessels crossing the the Atlantic (from New York to Liverpool) on a regular schedule--initially monthly departures in each direction using a fleet of four ships. I believe it is also of special vexillological interest as the name of the company came from the design of the house flag--a red swallowtailed flag with a black disk in the center. A black ball also appeared on the fore topsail (the second sail up from the deck on the foremast). The custom of naming or nicknaming the line after the flag was picked up by many others: the Red Cross, the Blue Swallow Tail, the White Diamond, the Black Star, etc. I think the black ball line lasted until at least 1881 as the Isaac Webb was the last ship that my great great uncle W.W. Urquhart sailed and she sank that year. I have a picture of the Isaac Webb clearly showing the black ball on the sail. Uncle Urquhart sailed for the Black Ball line. Black Ball Line. The founders were Isaac Wright & Son, Benjamin Marshall and Francis and Jeremiah Thompson. Loughran (1979) shows a tapered version of the flag shown above being common to the British company of the same name whilst a normal rectangular version is shown by the Mystic Seaport site. The flag format lived on with the grandson of Marshall, Charles E. Peabody using the last named version for the Alaska Steamship Co. as its first flag and then it was subsequently used by its subsidiary Puget Sound Navigation Co., hence the link which is mentioned by Dean. The Internet has quotes for both 1816 as the starting year and as 1818 as we have it. I get the impression, but would like confirmation, that 1816 is more often on foundation of the company, and 1818 more often on establishing the trans-Atlantic route. If true, this would explain the two starting years. I hope I won't disappoint Ruth Major about her family's history, but at http://www.geocities.com/mppraetorius/com-is.htm, Palmer List of Merchant Vessels has it that her great great uncle W.W. Urquhart sailed the Isaac Webb (even) after the line was dissolved, for Charles H. Marshall & Co., apparently run by the same Charles H. Marshall who ran the Black Ball line before its dissolution. I don't know how much earlier the Black Ball Line was dissolved, but it would have been before 1881 (especially since the Isaac Webb seems to have been lost on 25 October 1880). I expect the reason for the nickname "The Old Line", is that later, we don't give the date, James Baines in Liverpool (I think) started another line with a forked red flag bearing a black ball, and likewise named his company after the flag. Of the two Black Ball Lines, the newer one apparently sailed with considerably more ships, so it was probably more likely to be called by the name, leaving "The Old Line" for the first of that flag and name (see British Black Ball Line flag). According to Wikipedia the line was founded in 1817 in NYC. The Black Ball line was famous for initiating scheduled (packet) service, which was adhered to regardless whether or not there was a full cargo hold. Before this sailing dates were somewhat flexible. In 1851 another company in Liverpool set up using the same name and the same flag. On The Lore of Ships, page 136, A: House flag from Sailing ship days 3 "Black Ball Line, New York (1816)", the Internet has quotes for both 1816 as the starting year and as 1818 as we have it. I get the impression, but would like confirmation, that 1816 is more often on foundation of the company, and 1818 more often on establishing the trans-Atlantic route. If true, this would explain the two starting years. I expect the reason for the nickname "The Old Line", is that later, we don't give the date, James Baines in Liverpool (I think) started another line with a forked red flag bearing a black ball, and likewise named his company after the flag. Of the two Black Ball Line-, the newer one apparently sailed with considerably more ships, so it was probably more likely to be called by the name, leaving "The Old Line" for the first of that flag and name. There is a ferry from Washington State to Victoria BC, CA which wears a flag 'gules a pellet fimbriated argent' (a red flag with a white edged black ball). This line is sometimes referred to as the Black Ball Line (Puget Sound Navigation Co.). A little digging turns up that "Black Ball" is the nickname (flag-derived of course) for the WA state ferries, originally the Puget Sound Navigation System. Some of Seattle's maritime history is at: www.historylink.org/output.CFM?file_ID=2474. They use the name "Black Ball Line" for the PSNS, although not the State-owned system (from 1951). Further to the comments of Dean, the flag that he refers to of red with a white edged black ball belongs to Black Ball Transport Inc. with origins which go back to Puget Bay Navigation Co. and hence via Alaska Steamship Co. go back to the original Black Ball Line of New York. Puget Bay Navigation Co. had a road transport subsidiary called Black Ball Transport Service which R.J. Acheson, who was the traffic manager, bought in 1936. In 1952 he formed a subsidiary Black Ball Transport Inc. and in 1959 built the ferry "Coho". For a flag he obtained permission from Alexander Peabody of Puget Sound Navigation Co. to use a version of the Black Ball flag as used by that company by adding a thin white circle [ring] around the black ball and I have a photo of "Coho" 24.8.2007 clearly showing the flag flying with the emblem indeed being of generous proportions. In 1973 after the death of Acheson his widow sold the companies to ROCOR International but the ferry "Coho" continued to be owned by Black Ball Transport Inc. to the present day, based Port Angeles WA, and since the spring of 2008 has operated under the name of Black Ball Ferry Line. This company is not to be confused with Black Ball Ferries Ltd. which was the Canadian subsidiary formed by Alexander Peabody in 1951 prior to his disposing of most of his ferry fleet to Washington State Ferries. This company continued to use the Puget Sound Navigation Co. flag of a red with a black ball until sold out in 1961 to BC Ferries. Nor is to be confused with Puget Sound Navigation which traded as Black Ball Line. Following up on comments by Ken Bennett under Puget Sound Navigation and his lead on the ownership of the company I find that the sources I had previously found, and which all produced the same information, were obviously working off a flawed hymn sheet. Acheson died in 1963, not 1973, and his widow ran the business thereafter. The sale to ROCOR International was only for the trucking business and occurred in 1975 and Mrs Acheson continued to run the ferry service of Black Ball Transport Inc. until her death in 2004 when she left $21m to the University of Oregon. From the link http://www.canada.com/victoriatimescolonist/news/capital_van_isl/story.html?id=2f522dc5-1f33-49f0-8b6d-ca6c7e998ad9&k=94326 provided by Ken it appears that the University is now the majority shareholder in the company as part of the of the bequest and the shares are held by a trust for at least 10 years during which they cannot be sold. Originally called the American Diamond Line, this company carried cargo between New York and Rotterdam and Antwerp. It was hit very hard by the restriction imposed by US neutrality in the early stages of World War II. During the war, the company sold off all its ships--which were under government control for the time being anyhow--then tried unsuccessfully to get back into business after the war, ceasing operations in the mid-1950s. The flag was a black horizontally arranged diamond on a yellow field. However Talbot-Booth (1936) still shown the version with the letters although he ascribes it to American Diamond Lines Inc. which would be appropriate as by then the company, if actually incorporated, or even if only a trade name, was by then officially owned by Black Diamond Steamship Corporation. In 1938 Talbot-Booth noted that the letters had been deleted from the flag although he continued to show the lettered version in his 1942 and 1944 books but under the name of Black Diamond Lines Inc. which he states was formed in 1931 having previously been American Diamond Lines and being under the control of Black Diamond Steamship Corporation. The continued display of the lettered flag is probably an oversight with a Black Diamond Lines Inc. timetable for May-June 1939 issued 1.5.1939, trading US East Coast-Belgium/Rotterdam, showing the letter less version and confirming that the diamond was of generous proportions. Dockendorff ceased as a principal executive in 1934 and the sole ship he had bought in 1918 ["New Britain"] was sold the same year. The company itself suffered downturns which were accentuated by the advent of WW2 in 1939 with the neutrality restrictions which resulted in it chartering its US flag vessels to other American companies whilst chartering foreign flag ships in order to continue its European trade. After the war the company tried its ploy of post WW1 in gaining Government subsidies to then buy ships from them but they did not succeed and so they continued to operate for a while with chartered tonnage but found the competition too strong. Unfortunately Ren� de la Pedraja, a splendid source of information on the US maritime history, abbreviates his references as "Black Diamond" rather than giving the full company names so whether he is referring to Black Diamond Steamship Corporation or Black Diamond Lines Inc. is not clear. That the version as shown by Joe was used at the end is verified by the timetable. I believe from verbal descriptions I have seen that this is the Black Star Line that was a major force in Irish immigration via Liverpool to the United States in the mid-19th century. As best I can figure, a variety of New York lines operated from New York to Liverpool under their own names, but on the return trip flew the red pennant with black star of the Black Star Line. It was, in effect, a consortium, or at least that's what I make of the characterization of various companies' ships as "clearing from Liverpool in the Black Star Line." On the other hand, Williams & Guion Black Star Line were one of the companies so characterized, and their own flag featured a black star on a blue and white flag (also reported as a blue-white-blue horizontal triband). Maybe others know more about this history. I found several on-line sources that make it clear to me that the Liverpool "Black Star Line" was the Williams & Guion company (US flagged) before 1866 and the Guion Line (British flagged) after 1866. The flag for this company under both names was blue with a white lozenge and a black star on it. Most pictures have a five-pointed star but I've seen some with six points. In any case, I now don't know what "Black Star Line" would have flown a red swallowtail with a black star, but I did find it in the source I mentioned, without explanation as to its use. According to Chandler in Liverpool Shipping (1960) Williams & Guion had prior to 1866 owned the Black Star Line of sailing packets ceasing the emigrant trade by this means in 1863 when they moved into steam, initially by chartering, and then with their own vessels in 1866 as the Guion Steamhip Line based Liverpool, U.K.. It would seem then that this Black Star Line was American whilst Liverpool also had its Black Star Line formed by James Dowie & Co. Ltd. in 1855 with their last sailing vessel being sold in 1904 and sources show their flag as that given here. According to Chandler the Dowie company mainly operated with chartered ships which would explain the use of the flag on the return voyage to USA. The only problem with this theory is that Chandler only mentions the Dowie company as operating to Australia but that is not to say that they also did not operate across the Atlantic. "Square-riggers on schedule: the New York sailing packets to England, France, and the cottonports." - Robert Greenhalgh Albion. "Queens of the western ocean; the story of America's mail and passenger sailing lines." - Carl C Cutler. Founded to take advantage of the supply of cheap surplus vessels after World War II with the intention of operating between the Gulf of Mexico ports and Europe and the Mediterranean. It faced bruising opposition from Lykes Brothers SS Co, which had ruthlessly suppressed competition in that market for decades. Korean War business kept Bloomfield afloat, but it was soon taken over by the much larger States Marine Corporation, which stopped using the Bloomfield trade name in 1968. The flag was a blue swallowtail with a white star superimposed on a red "B." Messrs Boland and Cornelius founded what is now the American Steamship Co in 1907. American SS Co, now a subsidiary of GATX Corporation, operates one of the largest fleets on the Great Lakes. A white flag with a large red "A" and a blue border--I take it that the "A" is for American and that what Stewart (1953) calls Boland and Cornelius is in fact American Steamship. I speculated above that this was actually the flag of the American Steamship Co, then a Boland and Cornelius subsidiary and now the shipping arm of GATX Corporation. I have since found this additional source from the same general period that shows a different Boland and Cornelius flag: a white burgee with red upper and lower edges and the initials B&C in blue. Clearly this was the flag of the parent company and the A flag probably, as I had suggested, that of the subsidiary. Oddly enough, the house flag of this coastwise line was, for all practical purposes, the same as the modern Japanese national flag, a red disk on a white field. Boston Towboat Co. / Boston Tugboat Co. I am trying to locate a color image of the Boston Towboat or Boston Steamship Co House Flag. I have a very blurry black and white photo of the steamer Pleiades (ca 1904) with the house flag at the masthead. The ship is moving and wind is moving the flag, but I can make out a plain field and a capital T on the flag. I can�t tell if it is rectangular or a burgee. I don�t believe it is a pennant. Since it�s in B & W, the field appears as medium gray and the T is a darker gray. I also have a portrait of the ship, in oil on silk, painted in China in about 1901 when she was new. This does not have the house flag, but the funnel has the large T on it. The T has serifs and is painted yellow! Former Transpacific Liners of the Boston Tugboat Company on the Market�Both Chartered. Unless the name "Pleiades" ("Pleaides") was rather popular with Boston shipping companies, it would seem circa 1904 the ship was owned by the "Boston Tugboat Company". Boyd & Hincken was one of the major firms of sail packet operators in New York in the mid-19th century. Its ships displayed an unusual triple tailed flag consisting of a red hoist with a white ring (or letter "O") and three tails of yellow, white, and yellow. The ship's of the firms New York & Havre Line (also known as the Second Line of Havre Packets) had the same flag but with the letter "B." Nothing on this 19th century sailing company except the flag, red with a white disk bearing a black "B." The Ocean Steam Navigation Company, or Bremen Line, was the first U.S.-flag steamship company to offer regularly scheduled trans-Atlantic service. It was founded in response to a U.S. government decision to subsidize a steamship operation by means of mail contracts in an attempt to compete with British government subsidies to British lines. Edward Mills, a novice in the shipping business, led the syndicate that received the contract for mail delivery to Le Havre and Bremen but was unable to attract sufficient capital to carry out his original business plan and began operations with only one ship, the Washington, in June 1847. It was a poorly designed ship, slow and with insufficient cargo space, and the government soon revoked the Le Havre portion of the mail contract because of the line’s poor performance. Nevertheless, the Bremen Line survived until it was driven out of business in 1857 by Cornelius Vanderbilt’s more modern fleet in 1857. The house flag of the Bremen Line was the red and white striped Bremen ensign, defaced by a white panel bearing a profile of the ship. The flag shows the line’s first ship, the steamer Washington. A New York firm operating to California in the Gold Rush period of the 1850s. Simple and effective, a red cross on blue. In the China and California clipper trade in the mid-19th century. 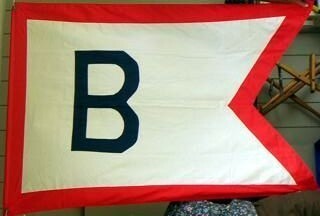 The flag was white with the initials B over C in red. A. H. Bull & Co.
An early version of the flag, with the border all the way around instead of just on the upper and lower edges and fly. Archibald H. Bull was the founder of the British-flagged New York and Porto [sic] Rico Steamship Co in 1885, which succeeded an earlier line of sailing packets on the same route that he had established in 1873. In 1900, his stake in the company was bought out by his partners in a hostile takeover, and Bull was forced to give up running steamers to Puerto Rico for 10 years. So in 1902 he set up the Bull Line to serve the US Atlantic coastwise trade and operate sail vessels to Puerto Rico. Bull's heirs eventually failed to see wave of containerization coming, sold out to American Coal Shipping in 1956. Sea-Land, the pioneer container firm wanted to buy the line in 1961, but instead it was sold to Greece's Manuel K. Kulukundis, whose companies all went bankrupt in 1963, bringing the Bull Line's history to an end. The flag was a white swallowtailed pennant bordered in red, with a blue initial B.
I am told this is a replica of the Bull Line flag was copied from the china pattern and old photos. Lloyds (1912) actually shows a normal swallow-tailed flag, as does the 1904 version though these are probably incorrect renditions. The tapered version, being the first shown here, does not appear until Brown 1934 but I get the impression that none of the regular sources were exactly sure what flag applied with the main problem being the Baltimore Insular Line Inc. [not Bull Insular Line according to Talbot-Booth and Lloyds] with the version shown being that of number 3 here but with a red border at hoist and those sources showing this as being for A.H. Bull & Co. Inc. though Talbot-Booth in 1938 does comment that the "I" no longer applied on the flag but for all that he continued to show it included through to 1949. Of the main originating sources, Wedge (Brown series) shows the 3rd version here in 1926 and 1929 but with a red border also at hoist, thereafter showing the 1st version. Talbot-Booth shows the 2nd version and Stewart & Styring (1963) (I understand Styring had a lot of input into the US Navy publication) show the 2nd version. All very confusing and I for one remain completely unsure of what is a legitimate answer. No information on this--and a boring flag with a white B on a red field.